Visit Madame Tussauds' newest location right in the heart of 'Music City'! 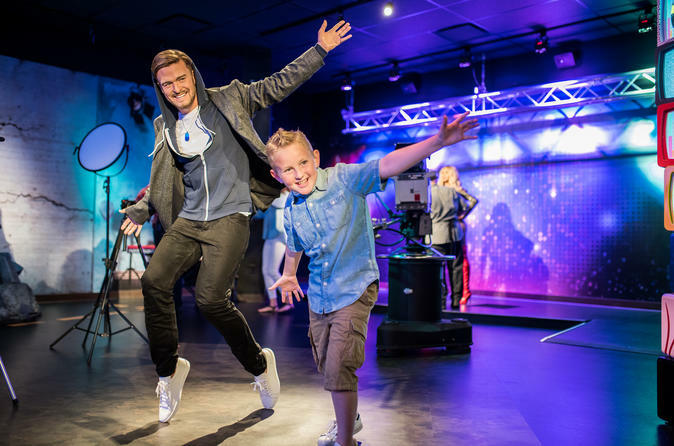 Get acquainted with your favorite musical icons from past and present at Madame Tussauds Nashville, which features more than 45 lifelike wax figures. This is the only Madame Tussauds that will focus solely on the musical legends that have shaped music as we know it today. Located minutes away from the Grand Old Opry, Madame Tussauds Nashville lets you interact with more than 45 lifelike wax figures of musicians from past and present. As there are no ropes or barriers to the attractions, you can touch and be photographed right next to wax versions of celebrities! You'll get an opportunity to get up close and personal with greats such a Johnny Cash, Taylor Swift and Reba McEntire and more. Also featured are themed zones like WSM Studios, MTTV featuring current pop icons, Music Alley and the Grand Ole Opry where you can touch and take photos with your favorites in fun and famous scenes. This interactive and family-friendly attraction features incredibly lifelike iconic figures from the world of music. The first music themed attraction of its kind will lead you on a historical journey through the past and present of American Music. You'll be immersed through vivid scenes supported by a colorful cast of figures from all genres of music including Stevie Wonder, Trisha Yearwood, Bruce Springsteen and Carrie Underwood. Special Offer - Book and save 23% compared to the price of local admission for travel anytime! - Book Now!